Live TV coverage on BBC1 & BBC1 HD, live audio commentary on BBC Radio 5 Live; live text commentary on BBC Sport website. Ian Rush believes Cardiff City's best hope of a Carling Cup shock is for Liverpool to wilt under the pressure of ending a six-year trophy drought. Championship side Cardiff go into Sunday's final as huge underdogs but Rush fears expectations could harm their Premier League opponents. "You have to be strong enough mentally to deal with that pressure," said the record-breaking ex-Liverpool striker. "If you can't put up with it mentally then it's going to be a problem." Liverpool, making their first appearance to the new Wembley Stadium, have not won a trophy since their FA Cup triumph at Cardiff's Millennium Stadium in 2006. And Rush added: "It's a no-lose situation for Cardiff because they are not expected to win. But deep down I think the supporters, the players and the manager will think if they can get it together and Liverpool don't, they could win it." 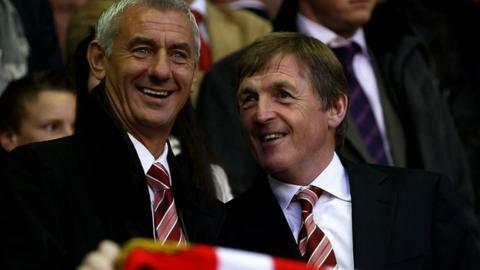 Rush won the League Cup a record five times with Liverpool, four of which came while playing alongside current manager Kenny Dalglish in successive years from 1981-84. A League Cup win is the one domestic honour that has eluded Dalglish in his glittering managerial career, and Rush believes the manager has a crucial role to play in setting the right attitude for the game at Wembley. "If you get to any final there is no easy ride. It's what you make of it," said Rush, the League Cup's joint top-scorer with Sir Geoff Hurst on 49 goals. "Yes, Liverpool are favourites to win but if they go about it with the wrong preparation they are in for a big shock. Cardiff are capable of beating any side on the day. "This is why cup finals are so special because on the day anyone can beat anyone. "That's what it's all about and that's why for me the FA Cup and the Carling Cup are the best cups in the world. That's the beauty of the cup." Rush believes Craig Bellamy will play a significant role in the outcome of Sunday's match when the Liverpool striker will face his home-town club. Bellamy spent a season on loan with the Bluebirds last season but fell narrowly short of achieving his aim of guiding the club to the Premier League, when they lost out in the play-offs. "He's been one of our star players without doubt," added Rush. "His attitude is absolutely fantastic - he wants to win." Bellamy has refused to comment on whether he intends to prolong his international career with Wales beyond next Wednesday's friendly with Costa Rica, organised as a memorial match for former manager Gary Speed. Speed persuaded Bellamy not to retire from Wales duty last year and Rush said the 32-year-old striker still has plenty to offer his country. "We need Craig for the younger players but only he can make that decision," said Rush, Wales' all-time leading scorer. "If he decides he wants to prolong his career at Liverpool you have to respect that decision. "Ryan Giggs did it and he's still playing for Manchester United. Craig might be thinking he might be playing for Liverpool in two, three of four years' time."